FMF - Friends of Minerals Forum, discussion and message board :: View topic - The Almadén's "Spanish flag"
Posted: Aug 06, 2007 05:15 Post subject: The Almadén's "Spanish flag"
One of the more intense histories that I had with Sr. Folch relates to an Almadén Cinnabar. In 1983 I visited Almadén and one of the more active miner-sellers from there, Isidro Mendoza, contacted me extremely excited: "Jordi I got the best Almadén Cinnabar ever, it is like the Spanish flag!" Surprised and also excited by his excitement I went to his poor home (salaries of miners in Spain at that time were very low) and there after a long theatrical masterpiece performance he finally unwrapped the specimen and he showed it to me. 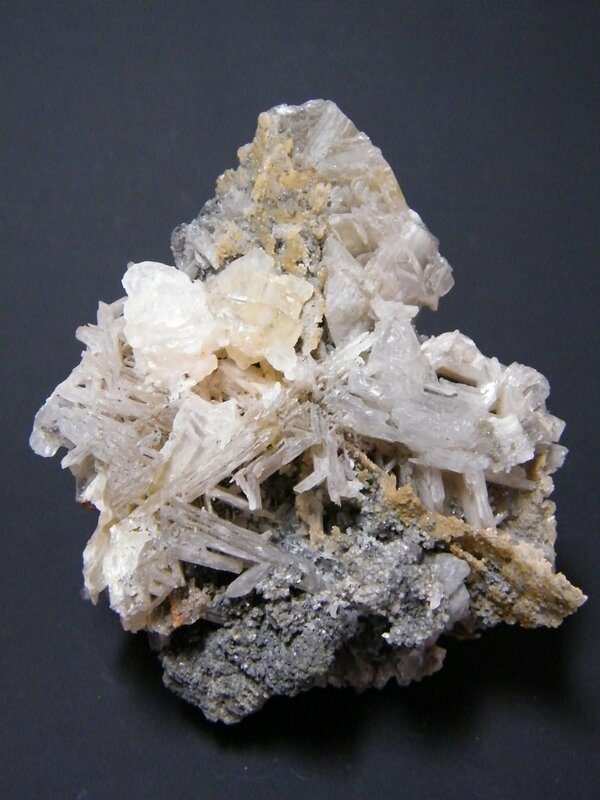 It was really good, much better than any others from Almadén for several reasons: crystal size, color, very white Dolomite matrix, but especially for its shape, with all crystals, very flat, grouped in the center of the specimen and with the white Dolomite crystals above and below, so certainly it resembled the Spanish flag, just replacing its yellow color by the white of the Dolomite. 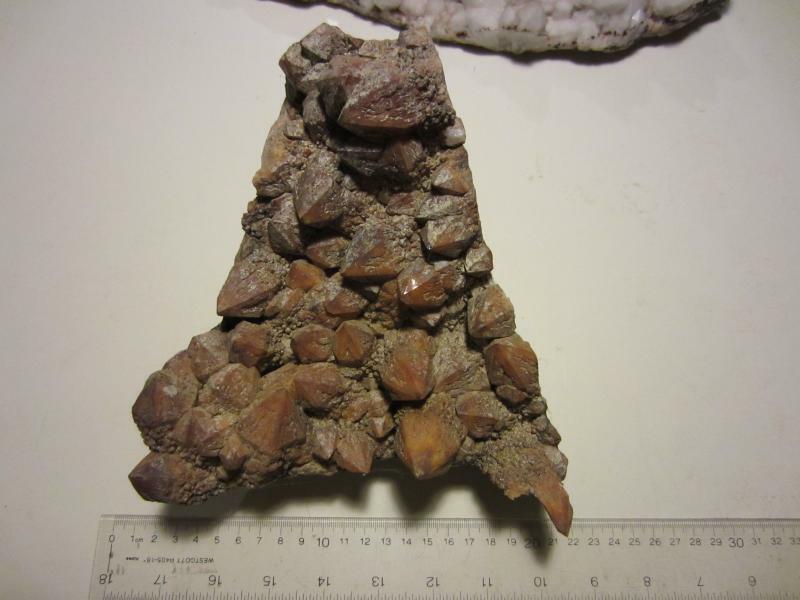 Well, I tried to negotiate the specimen but unfortunately the price was too high for me, so I called Sr. Folch and I explained him that I saw a great specimen better than the Almadén Cinnabars in his collection (and any other, the Chinese Cinnabars were not on the market at this time). He was also excited, he requested a lot of details about it and finally after a long, long, discussion he asked the price. When I told him he seemed to be offended and he explained to me that the Mexican mine of El Doctor, in Querétaro, produced a lot of exceptionally big Cinnabar crystals and for a very cheap price, so it made no sense to pay so much for this Almadén one (a short note to explain that later I never saw this kind of Cinnabar from México, so maybe it was a kind of strategy of Sr. Folch to push down the price). I tried again with Folch by phone but we couldn't arrive at an agreement and after two days of discussions I finally left Almadén without the "Spanish flag". Well, the specimen stayed inside my mind and shortly I returned to Almadén where the "Spanish flag" still remained. The miner also remained strict and he wouldn't grant any reduction. Worse, he raised the price, so no chance and I desisted for a second time. On my return I had long talks with Sr. Folch (by phone, Sr. Folch was already very sick and for this reason he didn't meet people) concerning the Spanish flag but we never arrived at an agreement as he insisted that the price was too high. Again in 1984 I returned again to Almadén and the Spanish flag still was there, and still the miner wouldn't accept any negotiation about the price. I tried again to call Sr. Folch explaining him my very good feelings about the Cinnabar but when I called him I got the very bad new of his death. Several years later I met at a Spanish Mineral Show, Sr. Rafael Turró, Folch's secretary and assistant and after our common happiness over meeting, we talked about Sr. Folch and how his life was absorbed by his passion for minerals. Then Sr. Turró said to me: "and Jordi, the best example is the mineral that you were negotiating for him in 1984!" The Spanish flag came back to my mind immediately and, very surprised, I asked Sr. Turró about his words. Then he said to me, true or not, that Sr. Folch, when he was in the last days of his life, asked to his family to place him, not in the bed, but on a couch, just to receive my calls as he was obsessed about the Spanish flag and he didn't want to miss my potential calls announcing, maybe, a better price to -finally- buy the specimen! This is the first half of the story. When I have time I will write the second half, that I think is still more interesting and exciting than this first half. After the death of Mr. Folch, the Spanish flag still remained on my mind so on my next trip to Almadén, I asked Isidro Mendoza again about it. The Cinnabar was still there and finally he reduced its price a little bit, so making an effort I gathered up all of my poor capital: not enough money. At this point I called my mother telling her to send to me some money so I could pay the total requested for Isidro. She did it and the Spanish flag was mine! But for a very, very, short time. In my trip back to Barcelona I stopped in Madrid and I offered the Spanish flag to Jesús Talabán, a Spanish dealer with good contacts with foreign people (he recently passed away. I wish the best for you in your other life Jesús). He bought it immediately but giving to me a very small profit, but I was then able to return fast to my mom her money. Years passed, and always the Spanish flag stayed on my mind. 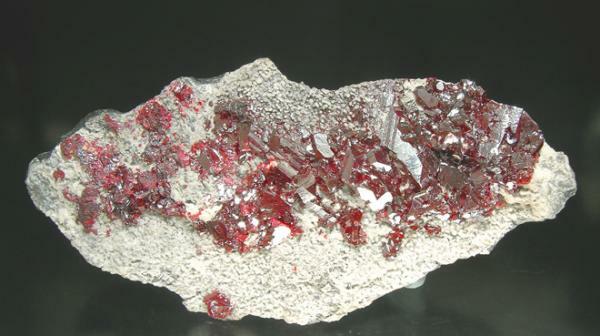 I became more and more a strong collector of Spanish minerals and for sure I don't have in my collection any Cinnabar from Almadén to compare with the Spanish flag and I missed a lot this particular specimen. One day I received the Mineralogical Record's September-October 1988 issue and when I read it I found there an article about the Almadén mine from a US geologist, Jack W. Crawford, who worked in Spain as a geologist for a while. Reading the article the specimen's image figure 9, in page 301, struck my eye and it seemed to me that the Spanish flag was one of the specimens in Jack's collection presented in this article. I wasn't sure because the photo was not so good, so I called Jesús Talabán and he confirmed to me that he sold the specimen to Jack Crawford. Years passed again and in Tucson 1997 I received a visit from a fellow speaking Spanish badly with a strong English accent. He introduced himself as a geologist who worked for a while in Spain. Yes, it was Jack Crawford! I noticed that he was established in Tucson and that he owned a store of minerals and handicrafts. Immediately I asked him about the Spanish flag and he confirmed to me that he still owned the specimen. I ask him to let me know if some day he changed his mind and decided to sell it, and we shook hands staying (I supposed) as good friends. Next year, in 1998, always in Tucson I received again his visit and to my extreme happiness, he proposed to me the purchase of the Spanish flag. As soon as I found someone to stay in my room (the well know "fishbowl" in the Executive Inn at this time) I met Jack in his Tucson store, where he showed to me the Spanish flag after all these years. Sadly I noticed that the color wasn't the blood red that the Cinnabar was when I bought it. I commented on this fact to Jack but he couldn't remember if its color was so red or not when he bought it from Jesús Talabán. Well, although not so red it still was a great specimen, so I negotiated with Jack strongly and heartily and finally we arrived at an agreement and I bought it from Jack for much more money that I sold it for to Jesús Talabán! I brought the Cinnabar to Barcelona and when I arrived here, I checked it carefully and it seemed to me that basically it was really dirty, so I placed it inside a plastic bag, I covered it with warm water and I added a minor amount of soft detergent. As soon as I placed it inside the water I saw a grey cloud starting around the Cinnabar, a clear signal that something happened, and when I washed it under running water: Hale hop! the Cinnabar recovered almost all of its original blood red color. It had just been very dirty! Today I am actually the fortunate owner of the Spanish flag and I can just say that I feel that for some reason destiny chose me to own this specimen and, implacably, never relented until it ended up in my hands for good. The "Spanish Flag" Cinnabar from Almadén. Specimen size: 13 x 6.5 cm. Main crystal size: 2.1 x 0.8 cm. Posted: Aug 14, 2007 04:34 Post subject: Re: The Almadén's "Spanish flag"
It might help if Jordi can include a photo of the real Spanish flag for comparison. The wonderful irony of this story is that if Sr. Folch had been persuaded by Jordi to buy the specimen, then it never would have ended up in Jordi's collection. Another bit of irony is that I believe that I am the person who Jordi ask to watch his stand in the "fishbowl" when he went to negotiate with Jack Crawford. Posted: Aug 17, 2007 02:22 Post subject: Re: The Almadén's "Spanish flag"
...Another bit of irony is that I believe that I am the person who Jordi ask to watch his stand in the "fishbowl" when he went to negotiate with Jack Crawford. Yes, I think that you was the person who I asked to watch the "fishbowl" so, welcome to my history! Anyway, to be honest the similarity is relative. It was more a joke than a real similitude, Isidro started mentioning it and as the Cinnabar is so flat and its color so red, the name stayed. Posted: Aug 17, 2011 03:49 Post subject: Re: The Almadén's "Spanish flag"